Implants from £1800 (with crown) and 3 unit implant bridge from £2700. The metal screw will be surgically placed directly into your jaw bone by your dentist which will provide maximum stability. Depending on the condition of your mouth and jaw bone, the dental implant 'abutment', which is the crown or bridge that fits onto the screw, may be added immediately after the screw is inserted. In other cases the dental implant may be added at a later date. Either way, there will be some healing time. The metal screw will slowly mesh with the bone, becoming a natural component of your jaw. If you have lost multiple teeth, you may be wearing a denture. This can cause embarrassment, discomfort and can generally have a real negative impact on your quality of life. Multiple teeth can be replaced with just a single dental implant. The implant screw can support a bridge of up to four teeth in a row, each stable and sturdy and guaranteed for life with good hygiene and maintenance. 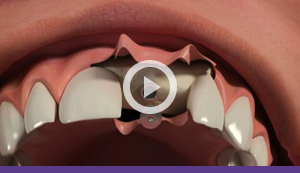 Depending on the jawbone, a dental implant and abutment can be placed on the same day.. The implants will look and feel exactly like your natural teeth.